This year has been a first for us....from the land to the table. Now, more than ever, we need to make decisions about cooking and eating that support the kind of agriculture that takes care of the land we hold in trust for future generations. Somehow, because of an unusually rainy season, the corn could not be planted and so the winter wheat crop that was planted last fall as a cover crop turned into golden wheat, which was threshed at our farm this year. This was truly a historical moment for our family. 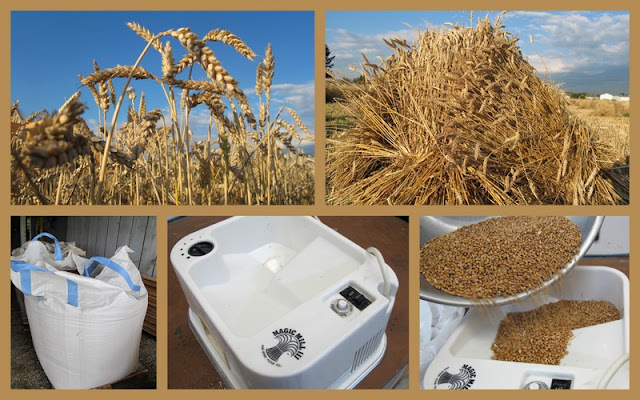 You can read about our experience of growing our first crop of wheat. Meanwhile, I was excited, because in my early years I used to cook for all our farm workers and I made all my own bread using freshly ground wheat. I found my old wheat grinder which was under a heavy coat of dust. I gave it an overhaul and put it to work. This recipe found itself straight from the land to our table. In a larger mixing bowl combine 2 cups of flour and yeast. Add to dry mixture in bowl. Beat at low speed with electric bread mixer for 1/2 minute scraping sides of bowl constantly. Slowly stir in oats, gluten, and remaining flour to make a stiff dough. Take note that gluten is added to freshly ground wheat flour in order to give elasticity and more volume. Shape into ball and place in a lightly greased bowl. Punch dough down and return to the lightly floured surface. Bake at 375° for 35-40 minutes. Take note: You can also make this same bread using commercial wheat flour and you would not need to add the gluten as it is only needed on coarse whole grain flours. Add a little bit of fresh butter with some fresh home-made blackberry jam. I will be packing a loaf of fresh bread for our anniversary picnic today! Pssst. I think you mean "yeast" and "honey"
I am thrilled to see this post. Every fall I contemplate grinding my own wheat for bread...you've inspired me. Will a blender do the job or will I need an actual grinder?? I'll have to research this. Have a wonderful autumn. It is deliciously chilly here in Iowa and we are nearing harvest. Thanks for the comments on agriculture too!! Well done Marg..your bread looks amazing! I will be using that gift bag of precious flour for this recipe. You must all go check out Marg's blog where she posted her wonderful wheat story and wish her and her hubby a Happy Anniversary! Beautiful bread. I have the same wheat grinder and love it. Thanks. Oh my, can I come by for a slice? This makes me want to bake bread again. I'm assuming you used instant yeast, judging by the method? The bread looks excellent! It's so amazing that you were able to grow your own wheat in our west coast climate. I have that exact same grinder! Actually, it was my husband's grandfather's and now it is here at our house. We are the only ones that grind our own flour. Have you ever heard of soaking your freshly ground flour before using it? I have done research and feel it is worth the extra effort - might be something you want to check out! Makes all those great bio-nutrients that freshly ground flour is packed with more available to our bodies for absorption. Looks promising, am going to give this a try. Thank you for creating and sharing this post. any tips for city girls on where to either get 'real' fresh-ground whole wheat, or to get unground (and also how to grind)? I am not sure where you live, but out here in the valley we have a brand name that comes from a local mill called Anita's. They sell straight off the farm, but also retail to health/deli specialty shops including local farmers markets. Most of these places should be able to assist you with your search of unground wheat. Check on line with your local town or city. You can see the costs of a wheat grinder at this sight. The Magic Mill is discontinued, and they suggest the K-Tec Kitchen Mill. Thank you! We're in Winnipeg - I'm sure we must have some equivalent, just not sure where to start. You've certainly inspired me to get looking though! Eric try Recipe Swap in your local paper. She's a great source for Wpg foodies who want to get back to basics and that recipe your grandmother made but you can't find. Go! Now!